The movement to “go green” has been a hot topic the past few years. Sometimes though, the eco-friendly choice isn’t always the most frugal or financially-friendly choice. For instance, eco-friendly or sustainably produced building materials are generally more costly upfront and it might take years before you see some return on your initial investment other than feeling good about “going green”. 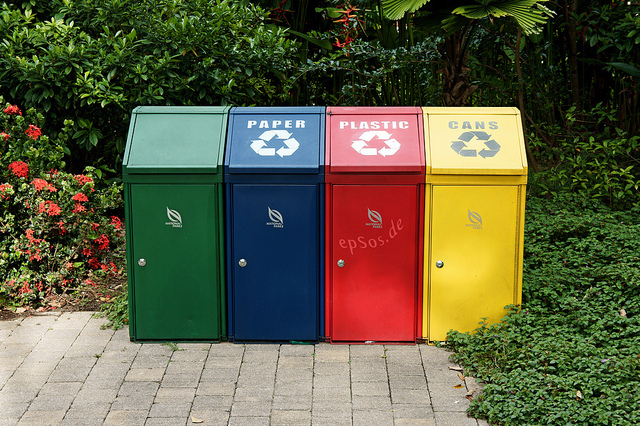 Luckily, by implementing the 3 R’s: reduce, reuse, and recycle, you can save money and “go green”. Here are just a few examples of how the eco-friendly choice can also be the frugal choice. Saving energy by setting your thermostat lower in the winter and higher in the summer can save you quite a bit of money throughout the course of year. Instead of relying on your thermostat to keep you comfortable while you run around the house in a t-shirt and thin pants, you can layer on some extra clothes and turn your thermostat down in winter. During the summer months, use ceiling fans, windows, and oscillating fans as a way to save money on utility bills. Reducing your water use is also a good move for the environment that will also save you money. Installing low-flow shower heads and parts on your toilets and faucets will cost a little money upfront, but they last for years and will pay for themselves many times over by the time you have to replace them. You can also set up a barrel to catch rain water the drains from your home’s gutters and use it water house plants or your garden. Try to borrow things instead of always buying them. Whenever I’m working on a house project, I always ask my dad if I can borrow some of his tools so I don’t have to go out and buy a set myself. This saves me money and reduces clutter in my home since most of these tools aren’t needed on a regular basis. I try not to indulge in take-out coffee very often, but when I do I always take my own reusable cup. My initial investment in this cup was $1 and I know I’ve saved way more money than that over the life of my cup. Plus I’ve saved a lot of resources from being used once and thrown away. At my local Starbucks you get a $.10 discount if you bring your own reusable coffee cup. This may not seem like much, but it does add up if you were going to spend money on their coffee anyway. Find ways to recycle things you would normally throw away. For instance, I am able to salvage a lot of things that many households would throw away and my parents use them for compost in their garden. I commonly take a bag full of “garbage” out to my parent’s compost pile. This reduces the amount of waste going to the landfill and saves my parents from having to buy good garden soil from another source. I have a set of trashcans in my garage that I use just for recycling. There’s one for aluminum, one for cardboard, and one for plastic. I also have a smaller container for glass and a box for magazines and paper. By making recycling these items a part of my routine, I’ve saved a lot of recyclable items from going to the landfill. Since my city charges based on the number of times they pick up your trash each month, I can save money by recycling as much as possible so I don’t have to put my trashcan out by the curb each week. Plus, the aluminum recycling plant pays a small amount each time you bring in your recycling. What are some ways you reduce, reuse, recycle and save money? Do you use your trash as a way to supplement your gardening needs? What is one outside the box idea you use to save you money? One month to go and summer is already here in our country. Instead of using our AC 24 hours per day, I will use our stand fan during day. By doing that, I know, I can save a bit of our electricity bill. Yes that’s a great way to save some money and “go green” for the environment too. I find pinterest really helpful when I’m looking on creative ways to reuse my trash. That’s a good idea! Now I just have to find the time to actually do the projects on there, haha. We recycle more than we throw away. It helps that our trash pickup people do a separate recycling pick-up twice per month. All we have to do is bag it and put it by the curb. I wish we had curbside recycling. We don’t so I collect and take my own to the recycling center when my bins get full. Our township requires recycling so we recycle most things. For food, we just throw it onto a compost pile and let it break down naturally. Great ideas! I think if our city had curbside recycling we’d have much more participation because it’d be so easy to do. We are recyclers in our home, but it’s pretty much just for the environment over our pockets. My hubby is a science teacher and obsessed with us not leaving too big of a carbon footprint. We’re big fans of reduce, reuse and recycle. One of my fave reduce activities is hanging clothes on the line as opposed to in the dryer. The benefits of the sunshine and fresh air far outweigh any work it takes. That is a great way to save some energy and get a fresh smell into your clothes too. Awesome job Laurie! One of the activities related to 3Rs I do with my kids is the catalog necklace. We use those old magazines and catalogs (or wrapping paper and junk mail) and we transform them into a colorful necklace. I still have the reduce/reuse/recycle song stuck in my head from when my kids were taught it at school, and I’m not even complaining about it. It just means that they understand the basic responsibilities they have when it comes to being environmentally safe. Yes! This is so true. I’ve earned money by reusing, recycling and reducing!